When I Whistle (translated by Van C. Gessel) introduces us to Ozu, a typical middle-aged salaryman on a business trip to the Kansai region of Japan. This return to his childhood home evokes a feeling of nostalgia for the past, and he begins to relive certain pivotal experiences from his high-school days. Anyone who is immediately reminded of the start of Haruki Murakami’s novel Norwegian Wood is in very good company (i.e. me); however, where Murakami’s book is a story which lives entirely in the past, Endo’s novel is a two-track tale. One strand follows Ozu down memory lane, describing his life after the arrival of a new student at his school, the enigmatic (and curiously-named) Flatfish. The arrival of his new friend, an easy-going, smelly, oafish boy from the sticks, is a memorable event in Ozu’s youth, not least because it leads to an encounter with a high-school girl, Aiko Azuma, with whom the two boys are doomed to be obsessed. 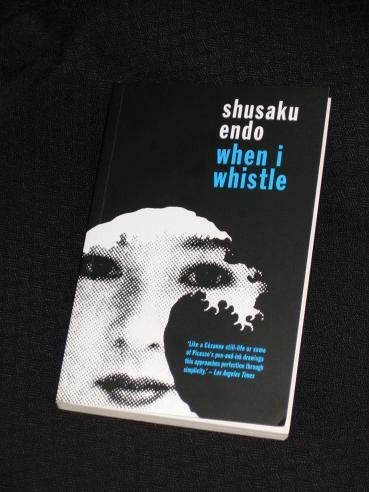 When I Whistle is an excellent novel, switching between the two stories to examine the differences in Japanese life in the 1940s and the 1970s. We get to look back at what was and what might have been – before being shown what actually eventuated. There is an overwhelming sense of a loss of a simpler way of life, one which may have been less comfortable, but perhaps more ethically right. Eiichi had got used to lying to cancer patients. Lying to them was part of a doctor’s job. Ozu’s son is contrasted with another doctor, Tahara, who stands up to his bosses and is promptly sent packing to the provinces. However, what would have been a fatal blow for Eiichi is actually a Godsend for his colleague. The time away from Tokyo allows him to appreciate the freedom to work for his patients rather than himself – something Eiichi could never understand. A statement which would probably bewilder those Europeans who assumed that the war started over in Poland! What also comes through again and again in When I Whistle is the corruption of the powerful and the consequences of the Japanese tendency to blindly follow authority. Officers beat new recruits half to death, and nobody bats an eyelid. Surgeons prescribe useless drugs because of links to pharmaceutical companies, and the doctors nod and scurry off. Those same doctors lie through their teeth to cancer patients, and the patients treat them like Gods. At times it’s all a little depressing. Endo is probably one of my favourite Japanese writers, together with Tanizaki. I've got a couple of his novels on my TBR including Silence, so hopefully I'll have time to read that in January! I agree, A Personal Matter is as Japanese as it can get. I have read Silence and am not familiar with other books by Endo so this is something to look into, thanks, Tony. Looking forward to reading this and Volcano in the new year, thanks for the prompt!. I have read Endo's Silence and Wonderful Fool; both are books I'll never forget. He has very powerful things to say about Christianity, in my opinion, a faith which is near and dear to my heart, and yet he makes me turn it over and examine it quite fully. Thanks for telling about this book of his I've not yet read. Bellezza – Funnily enough, this is one Endo book which doesn't mention faith or religion. While there is a strong focus on ethics and morals, it is much more of a secular focus than a religious one. ← The Law or Justice?